Emotional detachment disorder often forms in response to some sort of severe emotional trauma. As children, we are in an unequal relationship with adults who are powerful. If there is any type of abuse going on, a child often can’t escape and has to learn mental techniques to cope with the emotional trauma. These coping strategies often include distancing or detaching from feeling anything. It’s almost as if there is a different compartment in the brain where a person can go to shut of the unbearable emotional pain. In its most severe from – multiple personality disorder can form. 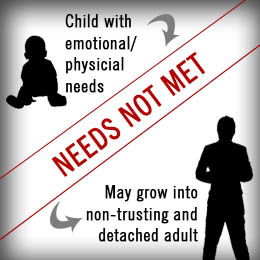 The problem with learning to detach emotionally from emotional trauma is that when we are in healthy relationships, that mistrust stays and at the slightest hint of hurt or rejection, a person with emotional detachment disorder will withdraw and become cold and unavailable for communication and sharing of feelings. This can interfere with healthy relationships. Feeling emotions is normal and healthy. Someone who has learned to suppress their emotions will often develop unhealthy behaviours to compensate for this suppression – such as many encounter with others sexually in a very casual manner, fear of intimacy, drugs, alcohol, gambling or other forms of ‘escape’. Counselling is an effective way to start identifying emotions and allowing yourself to feel again. Learning to feel emotions is scary but it makes life more exhilarating. It’s like being plugged back into the electricity – there will be highs and lows but you will feel alive again, instead of feeling you are just surviving and going through the motions.